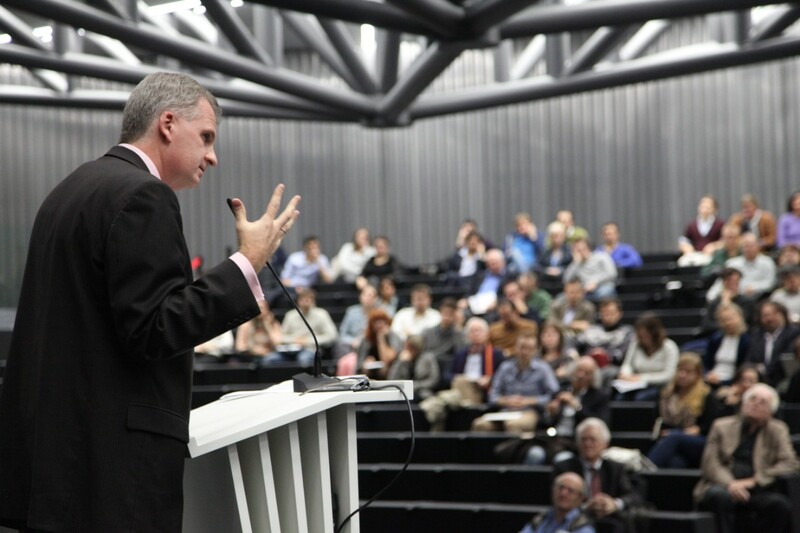 The lecture was held at 6:30 pm in the Auditorium Ivan Pictet, Graduate Institute, Maison de la paix, Chemin Eugène-Rigot 2, Genève. 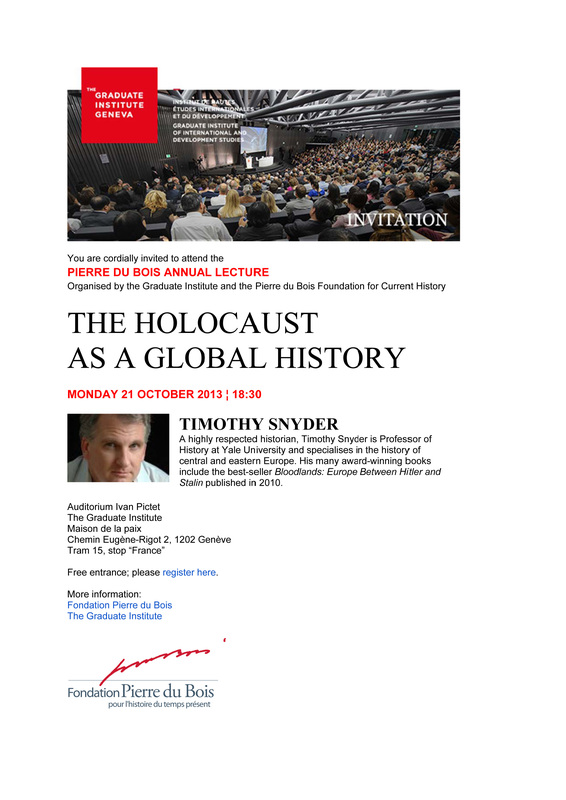 This year’s Annual Pierre du Bois Lecture, co-organised by the Graduate Institute and the Fondation Pierre du Bois pour l’histoire du temps présent, saw more than three hundred guests eagerly awaiting as Professor Timothy Snyder, one of Yale University’s most renowned historians, took the podium. 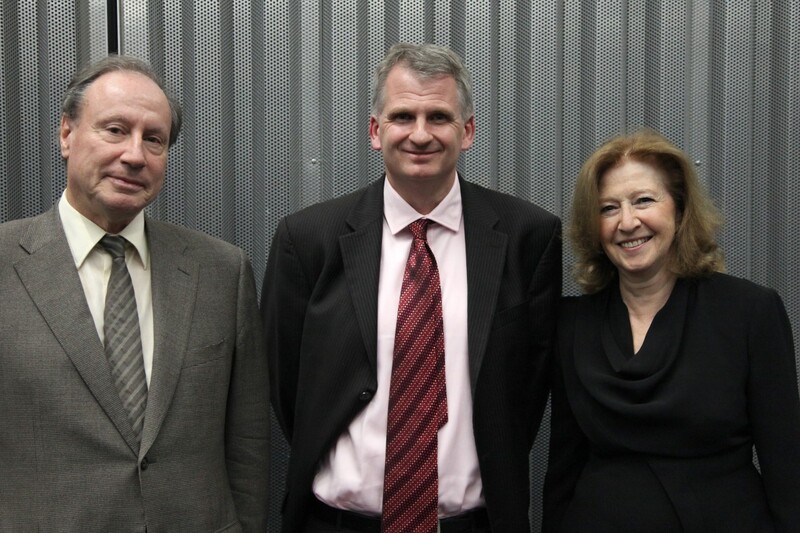 The Foundation’s President, Irina du Bois, expressed her tremendous excitement and gratitude to have the opportunity to host Professor Timothy Snyder for this year’s special lecture in the newly inaugurated Maison de la Paix. Snyder is a world-famous historian and author of numerous award-winning books. Most recently he published Bloodlands: Europe Between Hitler and Stalin. Bloodlands, which documents the Nazi and Soviet mass killings in the territory between ‘Berlin and Moscow’, has received numerous awards, such as the Leipzig Prize for European Understanding and the Ralph Waldo Emerson Award in Humanities. In 2013, this book was also awarded the Hannah Arendt Award for Political Thought. Snyder’s present lecture, entitled The Holocaust as a Global History, offered a vivid and surprising journey through a tentative chapter in one of his future book projects. Snyder argued that one could view the Holocaust as a ‘global history’ in three distinct ways. First, and most trivially, as part of the Second World War. For Snyder, however, this option is not worth pursuing. Second, one can conceptualize the Holocaust as an object of global history by placing it within Hitler’s thought about global politics and history, that is to say, as a matter of a coherent system of (political) thought that featured global repercussions. Third, one could narrate the Holocaust as global history by relating it, as well as Hitler’s thought, to the global concept of sovereignty. The latter two were of Snyder’s concern and led him to elaborate a great deal on what one might loosely call Hitler’s ‘political philosophy’. Snyder reasoned that Hitler perceived the world as inherently anti-political, as an ecological system in which human races struggle for survival and resources. Jews invented politics, so Snyder argued of Hitler, and it was with the invention of politics that Jews were able to turn upside down the natural power distribution of the world. The idea of the state of nature, the law of the jungle, a kind of biological anarchism and the master/servant relationship, as well as the “Jew’s purported role in ‘deforming’ them” constitute what Snyder terms the ‘Planetary Level’ of Hitler’s political thought. Because ultimately, so Snyder maintains, Hitler saw the master race’s need for Lebensraum not only as a matter of securing habitat, but also as a task to create a cultured, and beautiful ‘living room’ free of inferior races that ‘clutter up’ the landscape. To this end, Snyder stresses, a sufficient supply of arable land was needed to feed ‘the race’ beyond mere subsistence. Furthermore, Snyder submitted that Hitler thought if Jews and ‘Jewishness’ were removed, then the universe would return to its natural state. Because of that, Hitler considered the worldwide eradication of Jews as simultaneously a ‘colonising’ and ‘decolonising’ endeavour. Colonising because the Germans would by necessity become the masters of ‘foreign lands’; decolonising because they would liberate those fruitful lands from ‘Jewish colonisation’. This ‘act of liberation’, according to Hitler, would then also ring in the age of global agricultural modernity. According to Snyder, the colonisation of the Americas, that is, the extermination of the indigenous people to win ‘room’ for the master race of Germanic Anglo-Saxons, serves as a prime example of this, clearly demonstrating how Hitler imagined this colonial/decolonial mechanism to work out in reality. Snyder hence strongly emphasised the importance of colonialism and Hitler’s classical interpretation thereof. Finally, Snyder contended that Hitler, rather than being an unfaltering nationalist, was a radical global thinker. He proposed that for Hitler, the natural struggle was about the ‘stronger race’ emerging. Snyder maintained that Hitler strongly suspected Germany to be this race, but that he was not certain. In fact, this is why when the Red Army closed in on Berlin, Hitler did not see this as a contradiction to his beliefs. Simply, the Soviets proved to be the stronger race, the one that prevailed in the natural struggle. It is in this sense that Hitler was a radicalist rather than a pure nationalist. Snyder thus outlined the rationale, or “coherence”, in his view, of Hitler’s ideology, and suggested that it is because of its very coherence that it became globally implementable. Ultimately, Snyder’s talk made the audience feel as if it were getting a short glimpse into Hitler’s mind, accompanied by a good amount of witty and entertaining remarks by Snyder. Like with any ‘glimpse’, what one sees is part reality part imagination. In combination with Snyder’s claims, this fundamental fact led to a very lively Question & Answer session in which both the audience as well as Professor Snyder engaged and wrestled with the intellectual consequences of potentially seeing the Holocaust as a Global History.